Finished this last year, I was finally pleased with it and is one of my favorites. I had spent off and on several years getting it to Goldilocks just right…where I liked it. This originally was started in an abstract class shaping cones with string, I preferred doing it freehand. The colors in the painting match the frame texture and color with uncanny likeness. My studio is full of art works I may have decreed allegedly finished and then I look at them and decide to improve them, of course this mostly would be oils or acrylic…watercolor would be another story. I like this one to the degree, I may make it my blog header. 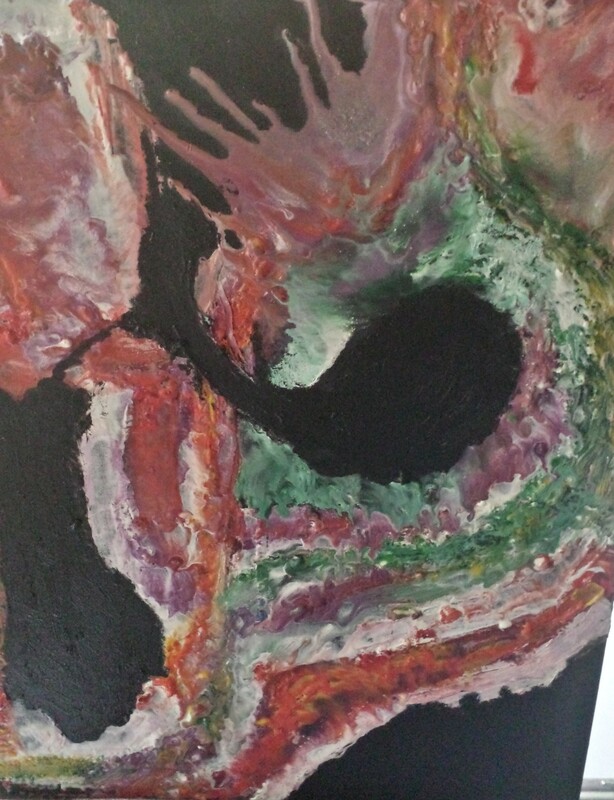 This is done in acrylics, it started out to be an abstract but turned out to be the devils play ground. I was trying out my new quart bottles of acrylic paint using a two inch brush, mostly to see if the the bottled acrylic colors would be vibrant and intense, and how they felt on panel. They did a good job…and with acrylics I find working in the zone most necessary. (zone tuning everything else out). I was inspired by Gauguin’s use of color and his work “vision after the sermon”. Being inspired by other artists is so important in my view, as part of growing. Been practicing with encaustic wax painting for the last several paintings and I am pleased with this one though it was intended to be an abstract but turned out to be a dragon. Encaustic wax painting is an old technique which entails using color and heated wax to paint with. For this one, I started with a black background and was intending to use only three colors for my abstract…but I could not help myself and used more color and it turned out as you see it. As so many artists have done before me… rising in the wee hours of the morning and packing tons of their art supplies to be on location… just to be there for the first rays of the sun, to capture those perfect shadows and the ever so evasive blue morning tint. Packing hot coffee, watercolors, bushes, easel and a never warm enough cold weather parka, always a very long hike to a vantage point on top of the highest hill… only to find out they forgot the water. 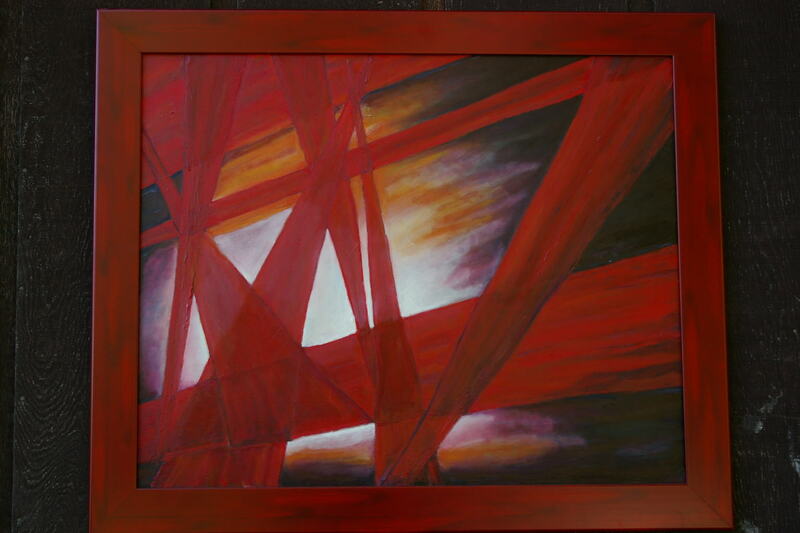 This abstract is called “Reeds on the River” it is mixed media on a full sheet. Ps: Actually I do most of my work in studio. Recently I have been on an abstract tear. 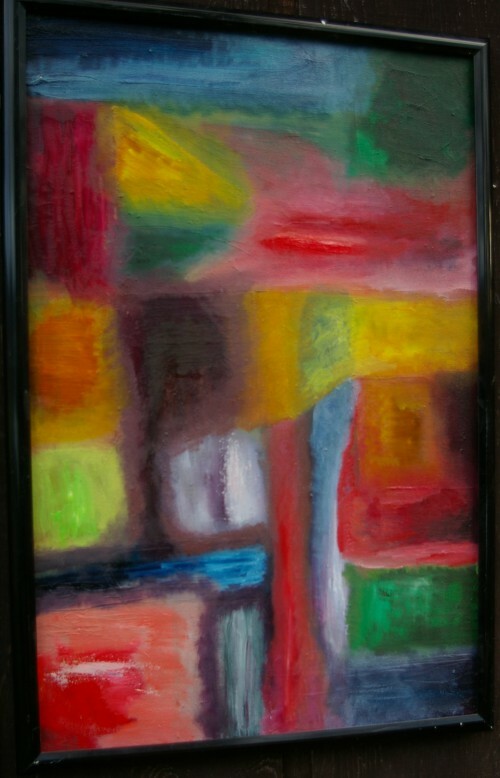 I really enjoy the freedom of experesson when in the zone doing an abstract painting, this one is a watercolor, if I recall a half sheet which means it is about 15 inches by 22 inches. Fyi: I made the error of not taking a photo of the painting before having it framed, which is a problem trying not to get a glare, same problem for oil paintings which have been varnished.